Our founder, Chryss Jamieson, left school at the age of 16 and started his career as a coach builder apprentice with the Brisbane City Council. After six years with the BCC, he then joined a prominent Brisbane coach bus manufacturer that specialised in luxury five-star coaches. Chryss had always dreamt of founding his own coach building business, and in 1986 his dream came true. The business began spray painting and repairing coaches and buses and transforming old coaches into mobile homes. It was here that Chryss set a precedent in terms of customisation, ensuring that each vehicle he worked on had a functional exterior, and a comfortable bus interior design providing completely tailor-made solutions for his clients. In the 1990’s the demand for new buses and coaches increased, and Coach Design embraced the challenge of supplying the market with new and innovative designs. This earned the business the first of their ‘Coach of the Show’ awards at the prestigious Sydney Bus & Coach Show in 1992. Over time, the ever-increasing demand for Coach Design vehicles inspired the first 4×4 off-road safari tour bus. It was an engineering challenge at the time, but before long the business had manufactured a successful line of vehicles that met the demands of providing a unique beach and outback experience for both drivers and their passengers. As innovative bus builders in Australia, by the early 2000’s, Coach Design went on to win five more ‘Coach of the Show’ awards at the Sydney Bus & Coach Show, and began to cement itself as a dominant leader in the coach building industry. Today, Coach Design employs over 40 staff, manufacturers over 50 vehicles a year and markets them to every capital city and a range of regional centres Australasia-wide. Our vehicles are the transport of choice for literally millions of people across both Australia and New Zealand! 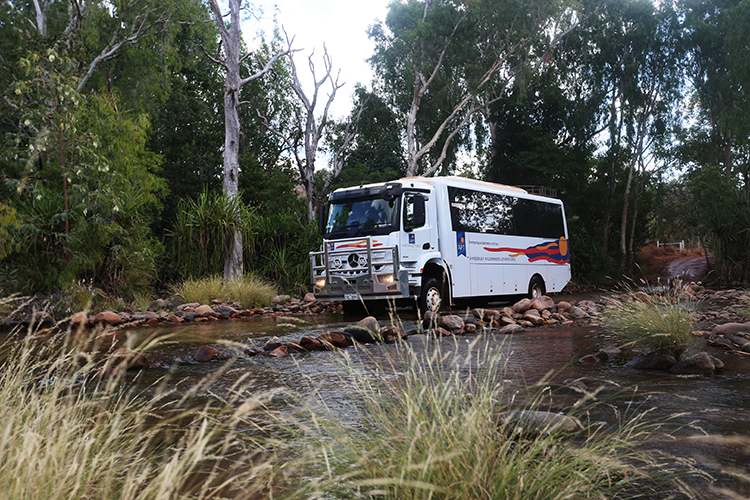 We supply 4WD vehicles to tourism hotspots like the Kimberley and Alice Springs, luxury touring coaches to New Zealand, and school and touring vehicles to a range of sectors and businesses across the country. We are the industry leader in Australia’s highly competitive bus and coach building market, and we provide our customers with a seamless experience on and off road. Outback Spirit took delivery of its first Coach Design coach in 2004. Since this time the company has taken delivery of a further 40 coaches, all of which are customised and tailor made for our specialist outback touring business. We love the Coach Design product because their coach saloons are quiet, very comfortable and feature all the usual 6 star inclusions our customers demand. Their coach bodies are also extremely durable and reliable and can put up with being punished year after year in harsh environments. They’re a great Australian made and design product, something as an Australian I’m proud of. Courtney Ellis	Director and Co. Owner, Outback Spirit Tours Pty. Ltd.
Coach Design have been our preferred coach-body supplier since 2004. We love the design and build quality that they provide; therefore, the majority of our coach fleet is now sporting the Coach Design body on a European coach chassis. Coach Design are always fantastic to deal with: they are flexible (allowing us to customise each new coach should we require it), have great design ideas and initiatives, and they have an appreciation of our demands for what we expect on a top-end touring coach. We look forward to each and every new coach that we have built through Coach Design and know, once it is on the road in New Zealand and complied for service, it will give us years of hassle-free touring. We don't look elsewhere for coach builds, as we want the very best, which is what Coach Design offer. During my 21 years of working in tour operations I have assisted in the specification and delivery of approximately twenty Coach Design touring units. These models have ranged from mid-size up to large coaches and 4x4 trucks with coach bodies, all have featured five star luxury equipment. I recall the quality finish of the first unit I was involved with in 1995 being quite striking and something that sparked a real WOW factor with our driver guides, they all wanted that vehicle! We are very pleased to say that all those years on, nothing has changed in regard to the quality and durability of the Coach Design product. The people at Coach Design are absolutely brilliant at working with us on the intricate detail our tour guests demand, their ideas and flexibility have assisted us to keep up and exceed market expectations. I would have no hesitation recommending these guys. We can build you a spectacular vehicle.